Our embroidered applique Awareness Ribbons have stick-on adhesive backing and are available in 23 popular colors. Prices range from .30 to .21 depending on qty ordered. Our embroidered Two-Tone Applique Awareness Ribbons have stick-on adhesive backing and are available in 12 popular two-tone color combinations. Prices range from .36 to .25 depending on qty ordered. 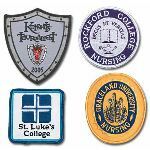 Our embroidered Specialty Design Applique Awareness Ribbons have stick-on adhesive backing and are available in 6 unique designs or shapes. Prices range from .39 to .30 depending on qty ordered. Our embroidered Specialty Design Applique Awareness Ribbons have stick-on adhesive backing and are available in our Purple-Walk and Peace designs.This item is just .20 while supplies lasts!